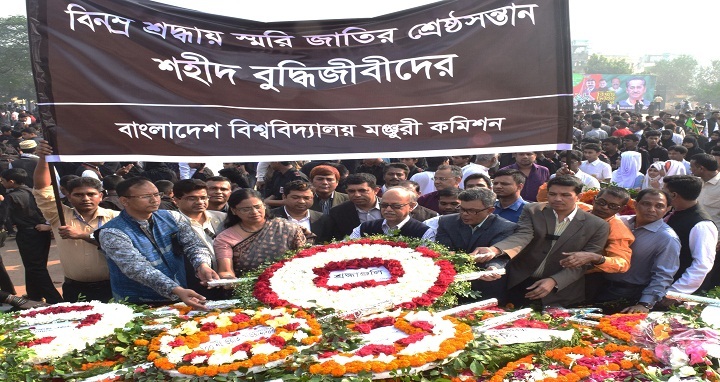 Dhaka, 14 Dec, Abnews: University Grants Commission of Bangladesh today (14 December 2017) paid rich tribute to the Martyred Intellectuals on Memorial at Rayerbazar killing ground in Dhaka. UGC Chairman Professor Abdul Mannan along with UGC Officers’ Association, Karmachari Union and other officials of the Commission placed floral wreath to mark the Martyred Intellectual Day at the memorial Thursday morning. Professor Dr. Dil Afroza Begum, Member, UGC, Md. Kamal Hossain, President, UGC Officers’ Association, Md. Mohibul Ahsan, General Secretary ,UGC Officers’ Association, UGC high officials, Md. Anowar Hossain, President, UGC Karmachari Union and other officials of Commission, were present during the time.